WAWZ/New York (Star 99.1) Program & Content Manager Therese Romano will exit the the station. “Between the economy and Hurricane Sandy, the past couple of years have been tough for our area and we’re grateful for what Therese was able to accomplish these past 24 months to serve our listeners and build the Star 99.1 brand,” says GM Scott Taylor. “I’m happy for her and know she will do well in this new opportunity.” Therese will relocate to Jacksonville in July to WAYR/Brunswick and WAYR-AM/Jacksonville as Assistant Station Manager. WCVO/Columbus (104.9 The River) has revamped its morning show. That new morning show (weekdays 5a-10a) lineup includes current morning show host Mary O’Brien along with new comers Greg Hansberry and Olivia Lomeli. After 3 years of Mornings with Mary and Josh , morning show host Josh Hooper announced that he would be leaving the show to occupy another position at the station. Greg comes to the River after working for Saga Communications WSNY/Columbus. Olivia is a five year employee of the River, and serves as the River’s Social Media Director. Hooper remains as Director of Creative Services and will heard in afternoons until a permanent host is hired. 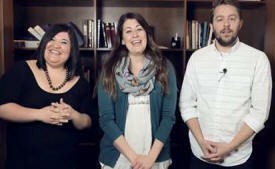 Pictured (L-R) are Olivia Lomeli, Mary O’Brien, and Greg Hansberry. As news of the Fort Hood shootings broke, SRN's "Hugh Hewitt Show" was just hitting the air Wednesday evening. "Hugh's program served as a Petrie dish for how talk radio can turn on a dime," stated Tom Tradup, v.p./News & Talk Programming for the Salem Radio Network, Hewitt's syndicator. Hewitt's producer Duane Patterson coordinated wall-to-wall Fort Hood coverage, including weaving news conferences with the FBI and Killeen, TX into the show along with special reports live from the SRN News digital news center in Texas. Guests (including a long-planned fundraising campaign to help children in Haiti through the charity "Food For The Poor" and experts reacting to Tuesday's major Supreme Court decision on campaign financing) had to adapt to the breaking developments and they became part of the programming. WRXT/Roanoke (Spirit FM) announced today that Isaiah “Izzy” Knight (at left) has joined the Team as Afternoon Show Host & Media Director. He has been part of the Positive Alternative Radio family previously, served as Digital Media Coordinator at WAWZ/New York (STAR 99.1), and recently was Director of Media Production/Event Marketing for the American Association of Christian Counselors. Salem announced an aggressive campaign to cross promote its various formats in a new and imaginative way. After recent research performed by Neilsen Audio and Edison Research showed Salem that when listeners of its Christian Teaching and Talk stations leave for another station, they are most likely to go to a News Talk station or a Contemporary Christian Music Station, it made sense to make sure they were going to Salem stations in these formats. Listeners will soon begin hearing promos on one station designed to encourage listeners to sample the other Salem stations in a different format. Gateway Creative Broadcasting, Inc. announces it will launch its new station in St Louis (BOOST 101.9) on Monday, March 24th. The BOOST 101.9 signal covers all of St. Louis proper and the immediately adjacent suburbs. BOOST will also simulcast on 94.1 for the Westplex out past Truesdale, 97.7 for those south and west of Arnold, down past Perryville and Salem, and on the HD2 channel of 99.1. Program Director Mike Couchman says “think of it as Clean Top 40 music. A diverse mix of Pop, Hip Hop, Rock, and EDM for teens, college students, and anyone with a young mindset. The music will be positive, fun, and faith based.” BOOST 101.9 format will feature artists like Lecrae, Skillet, Family Force 5, and Britt Nicole as well as St. Louis locals like Flame and Thi’sl (among others) and utilize Listener Driven Radio technology, BOOST 101.9 fans will be able to influence the music mix every hour: voting songs up and down the playlist at www.boost1019.com, plus through the BOOST 101.9 iPhone, iPad, and Android apps. As far as the on air lineup: Monday through Saturday mornings from 6 -10 AM it will be The Morning DNA, with Denee’ Hughes (D) and (N) Aaron Dicer (A) with Scott Anthony traffic and weather updates. Middays with Mike Couchman, Monday through Saturdays 10 AM – 3 PM. Afternoons with Neal Hopson, Monday through Saturdays 3 PM – 7 PM. Nights with Joey Landara, Monday through Saturdays 7 PM – Midnight. Late night and Sunday hosts include The Lou’s very own Scott Anthony, Kim Underwood, and Nick Spiniolas. Are Christian Talk & Teaching listeners younger than perceived? A new Nielsen-Edison research project on Christian Talk & Teaching finds that “half the listeners to these stations are under 55.” Salem Communications (the largest owner of Christian Talk & Teaching), commissioned “the largest research project ever done on the habits of Christian Talk & Teaching listeners across the country.” The study finds that 14% were 18-34. 18% were 35-49, and 18% were in the 50-54 demo. The study also revealed that the younger listeners to CTT stations are listening about as long as the older listeners. On average those 55 and younger are spending 6.1 hours per week listening to CTT stations. That compares to 6.4 hours for those 55 and over. One of the most surprising things revealed in the study is that listening among the 18-34 audience is actually increasing. This study reported that 48% of these younger listeners are actually listening more in the last 12 months and 38% are listening the same. That means 86% are listening more or the same. "There is this perception that these are your father's or even grandfather's radio stations, but we found there is a significant pool of younger listeners spending a great deal of time with our CTT format," said Salem VP, Director of Spoken Word Format, Phil Boyce. "These listeners are loyal, fully engaged, and are truly listening to the content for its edifying value." Salem feels this data and other supporting data bodes well for its efforts to continue to encourage advertisers to reach this segment of the population that is often difficult to reach in other ways. KVNE/Tyler and KGLY/Tyler listeners made over 21,000 homemade valentines. The cards were delivered on Valentine’s Day to kids in the hospital, assisted living seniors and a veterans home. Over 1100 individuals received an entire bag of valentines not just one. It not only blessed those individuals receiving the valentines but those individuals, families, small groups that made the valentines. We have women’s shelters, brain injury patients, church groups, office and families all making cards! It’s my favorite promotion of the year because it’s not just a bunch of cards but it’s love hand delivered. 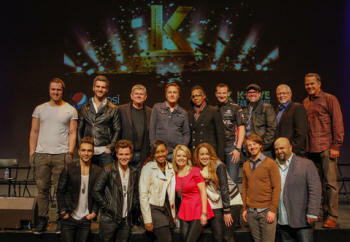 Air1 Program Director Randy Chase (left) has been named Director of Programming for K-LOVE and Air1 Radio Network. 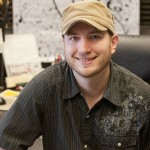 Chase joined Air1 Radio last summer and was previously with Cox Media Group handling all of their country formats. Chase replaces Chuck Pryor who remains with EMF in another capacity. Christian Radio for Russia Dan Johnson reaches out to HisAir.Net regarding the situation in Ukraine. Dan says, "The situation in Ukraine has taken a huge turn for the worse, and our station in Moscow, that targets large Christian audiences in both Ukraine and Russia, is trying to serve as a link to believers, urging them to take a Christ-like position in what is happening during this crisis. Our four radio staff are struggling to remain a viable broadcast operation, and perhaps in its 14 years of ministry, this time right now is the most important work it has ever undertaken." WNYM/New York (AM 970 The Answer) has hired Joe Piscopo as its new morning personality. The comedian/actor has been on the air since January 3rd. He is joined on the air by morning show producer Frank Morano and newsman Al Gatullo. "One of the best things I get to do in this job is find talented people who have accomplished something on one stage and are ready to take on another one," said Salem VP Director of Spoken Word Format Phil Boyce. HisAir.Net has confirmed that Salem Music Network has signed New York Times best selling author Karen Kingsbury (at left) as new afternoon personality. She is expected to start on the air 2-7pm sometime in April "On Today's Christian Music" including flagship WFFH/Nashville (94FM The Fish). Kingsbury will officially be introduced Monday at NRB 2014 Monday (2/24). She will make an appearance at the HisAir.Net booth 242 on the exhibit floor Monday from 10:30a-11:30a. Vance Dillard, program director of Salem's Today's Christian Music radio network and WFFH says, "Karen is a real communicator. She brings a naturally charming personality along with an ability to communicate one on one with our listeners. Every day will be a delight as she shares her wealth of stories and life experiences. This will be a unique listening experience." Salem Radio Network VP/news & talk programming Tom Tradup presented a commemorative SRN clock to Dr. Uzi Landau, (left) Israel’s new Minister of Tourism, following Landau’s address Sunday (2/23) to a packed ballroom at the annual National Religious Broadcasters Association convention in Nashville. Landau warned a packed ballroom at the NRB about the dangers of Iran being on the verge of developing atomic weapons. 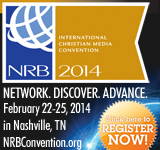 Be sure to stop by the ChristianNetcast booth 414 while at NRB. Their prize drawings on the last day of the show draw hundreds. You never know, this may be the year you win the big prize! HCJB Global announced today that the 82-year-old ministry, founded in Quito, Ecuador, is changing its name to Reach Beyond. The new name and the release of the Reach Beyond Mission Manifesto are intended to encourage and challenge Christians worldwide to reach beyond their comfort zones and perceived limitations to share the love of Jesus in places where the gospel has seldom, if ever, been heard. The mission is defined by the tagline, “The Voice and Hands of Jesus. Together.” Through its “voice” ministries, the mission works with partners to use radio and modern media to make the gospel accessible in places where it typically isn’t available. The “hands” ministries of the mission provide much-needed healthcare service in places where even common medical help isn’t readily available. Reach Beyond “hands” ministries takes many forms, including mobile community healthcare clinics, counseling centers in war-torn areas, clean water projects and general hygiene training, all with an emphasis on demonstrating the love of Jesus to recipients of the care. Network Program Director Jeff Connell, adds, "I've been a fan of Carlos for a long time and to have him joining WAY-FM is extremely exciting. He knows how to connect, challenge, and create a really interesting show and radio station. His passion and creativity will make WAY-FM even better. It's going to be a lot of fun." Embedded with the relief organization “Food For The Poor,” the group saw the poverty, devastation, and the still-vivid impact of the quake. Haiti has 80% unemployment and hunger and thirst are pervasive. 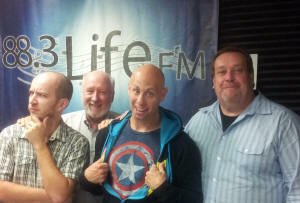 New Life Radio/Moscow Founder/Director, President Dan Johnson Checks in with HisAir.Net. "I wanted to share a situation in Moscow that might be of interest to fellow Christian broadcasters, and could really use some networking to get prayer on our behalf. In one week, New Life Radio (NLR) is being forced to terminate their satellite audio channel on the TRICOLOR satellite service, transmitting over Eutelsat W4. This is from pressure by the Russian Federal communications agency, ROSSVAZNADZOR. NLR will lose a very large audience on this secular satellite TV/radio service, the largest in Russia. Further, NLR will lose its sole remaining FM radio affiliate in Dudinka, Russia that will be out of signal range when NLR shuts down on Tricolor. While we still have a second satellite audio channel on the Hotbird satellite we need to get on a new satellite that can cover all of Russia with high power, free to air satellite radio signals, as well as to our affiliate, that can only be off the air for one month before losing their FM license (there is no radio staff, being a repeater of our satellite feed). KWND/Springfield (88.3 The Wind) is excited to announce that Mid-day host, Trina Wilcox, (at left) has been promoted to Music Director. Station Manager, Chalmer Harper, said, “Trina began as a volunteer with the station as a blog writer. This promotion is a testament to her hard work, willingness to learn, determination, and being a true team player. I am really thankful to have Trina at the helm of such an important part of our ministry.” Tracking times are 1-3 central Wednesdays & Thursdays. 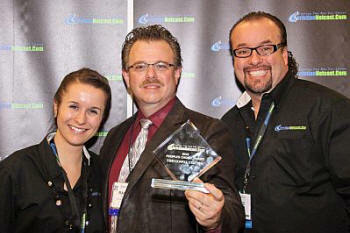 CMB held its Dallas Programming Momentum Summit (pictured left) Thursday Jan 16th. A broad range of topics included air checks, how to juggle priorities, tasks and your calendar, were discussed. Special speakers included consultant Tracy Johnson, former Radio Disney VP of Programming Robin Jones, and Byron “Ron” Harrell on “Time Management. Positive Alternative Radio has promoted within to add an Executive Vice President, two Vice Presidents and two new directors all as part of a continuing effort to advance the organization through innovation. Edward Baker, President of PAR, made the appointments. "Brian Sanders, who has been leading the pursuit of a new vision for PAR since March of 2012, is now promoted to Executive Vice President. " 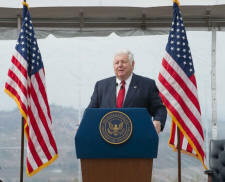 Baker said in his address to PAR leaders at the non-profit organization's annual Vision Conference. "Brian's leadership has helped PAR stations reach new heights in the past three years, and I am confident he is taking us in the right direction with our new vision to become the standard by which all Christian media is measured," he added. Baker also announced: Frankie Morea, General Manager at Positive Hits WPER, which reaches the Richmond, Va. market, is being tapped as VP of Programming for PAR. Daniel Britt, General Manager of Joy FM, PAR's southern gospel group of stations, has been promoted to Vice President of Culture Integration. 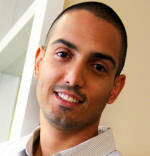 David Hodges, staff engineer for the organization, has been promoted to Director of Engineering for PAR. Kayla Sanders, Donor Services Manager, has been promoted to Director of Partner Services. "Each of these individuals will help lead us toward the future," Baker said. "We are so blessed to have this incredible talent pool in our midst and look forward to a bright future creating powerful experiences for our listeners that lead them to passionately follow Christ." 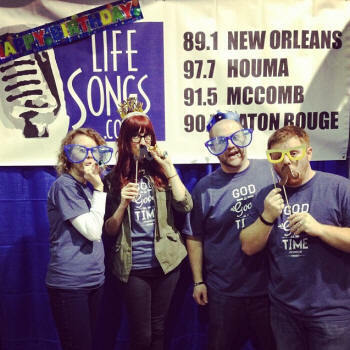 The demise of Christian radio has been greatly exaggerated. In fact, Christian radio is seeing growth in a number of areas throughout the country. But why not everywhere? Come to this session where you'll be challenged to look at your definition of success differently and how you measure it turned upside down. Listeners come when they are engaged, leave when they are bored. Are you informing, entertaining, inspiring, your audiences? In an over-communicated world where media is democratized, mobile and everyone can be a broadcaster, when anyone from virtually anywhere can create and send content to anywhere else, and to anyone else— what distinguishes you? It is the quality of your content - and here, good storytellers rule. WBCL/Ft Wayne announces the hiring of Lori Reese (left) as Promotions Director. In this position, Reese will be responsible for the overall promotional strategy for WBCL including development and implementation of station wide promotions, brand management, social media strategies, deepening community partnerships, and more. Prior to joining WBCL, Reese worked as a Promotions Director for CRISTA Media's KWPZ/Bellingham . At American Family Radio (AFR) Lauren moves from co-hosting afternoons (John and Lauren), to solo Mid-days. Lauren formerly was on the air at KFSH/Los Angeles (95.9 The Fish)... (1/6). Serving Christian Radio Worldwide Exclusively ... HisAir.Net! Got a topic or concern for the format you want to discuss. Write a short article and send it to [email protected].